Get ready for the next generation of 007 as Her Majesty's greatest secret agent embarks upon an all-new, action packed adventure. 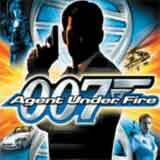 In James Bond 007 in … Agent Under Fire, the devious plans of a criminal mastermind once again threaten to bring the world's greatest nations to their knees and only one man can save them. That man is Bond, James Bond. Next generation console technology thrusts the player into the role of 007 like never before. Complete with high-tech weaponry, state-of-the-art gadgets, exotic sports cars, and beautiful women, this is the ultimate James Bond experience. The game's mix of intense first-person action and white-knuckle driving levels will transport the player to exotic locations where they will come face-to-face with the world's most dangerous villains. Only the clever use of firepower and tricks of the spycraft trade will allow them to save the world. An all-new, original single-player storyline written exclusively for EA GAMES. 12 action packed missions, including intense first-person action and white-knuckle driving levels. Support for up to four player split-screen multiplayer action. Beautiful Bond girls - The alluring Zoe Nightshade, the deadly Carla the Jackal, and the bombshell "Killer Twins." State-of-the-art gadgets - The Q-Claw, Q-Jet, Q-Laser, and more. High-tech weaponry - The Wolfram P2K, rocket launcher, sniper rifle, assault rifle, and more. Exotic automobiles - The Aston Martin DB5, BMW 750iL, and BMW Z8. Helpful Allies - The authoritative M and omnipresent R.
Devious villains and dangerous henchmen. Thrilling locations - Hong Kong, the Swiss Alps, Romania, a deep sea oil rig atop a secret underwater base and more.